Working capital and business long-term liabilities. A number of key business financial and operational performance criteria. One of the greatest strengths of this method is that it gives you the ability to see how a number of important factors affect business value. Once you see how sensitive your business value is to, say, its customer base concentration, or current product mix, you can make strategic decisions that increase your business worth. Thus, you can use Multiple of Discretionary Earnings as both the business value measurement and strategic planning tool. Business value changes with time. Your business valuation today may provide a reference point on which to base forward-looking changes. Armed with this knowledge of what drives your business value, you as the business owner can make far-reaching improvements that focus on growing your business worth. As time goes on, you can assess the effect of your efforts by repeating your business valuation. This lets you see how smart business choices translate into increased business value. 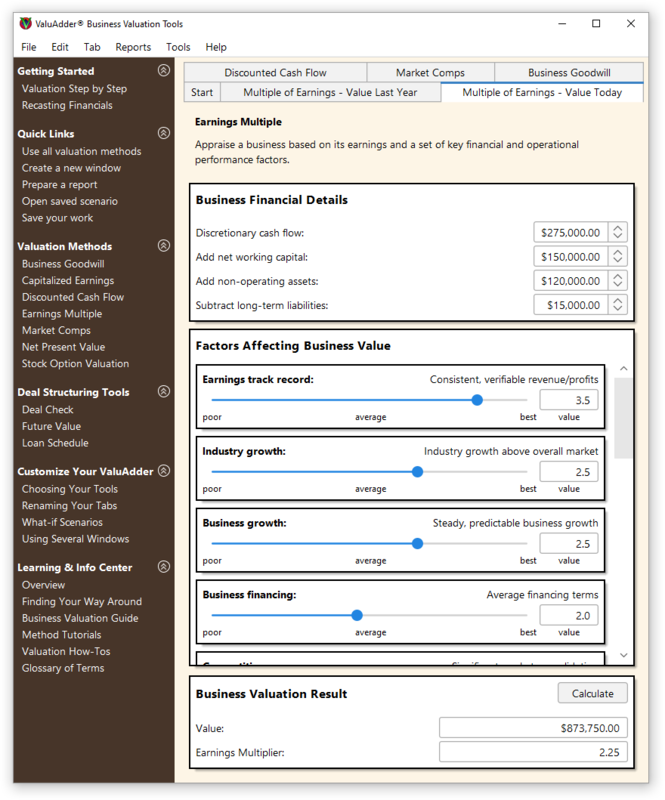 This example shows how to estimate your business value as multiple of its earnings. First, you use the recast business financial statements to determine the seller’s discretionary cash flow, working capital, and long-term business liabilities. Next, you assess the business overall financial and operational performance and assign values to the 14 key criteria. Finally, you calculate what the business is worth today. As you identify opportunities to increase business worth and implement your plans, your business value rises. Repeating your business valuation shows just how effective your changes have been – and how much your business worth has grown.